In voice mail feature, MSS need use SMTP library to send emails. Since MSS can embed Python script functions, it is easy to use Python-smtplib to send email. That’s what we done and it works well, we are satisfied with it. But smtplib is too old ( in python 2.7) to fit some modem SMTP servers’ requirements. It also has a shortage. It is synchronous. That means it can block thread when sending a email, then its performance is poor and cannot fit our requirements in cloud system. Something is changed, we want MSS to be better, so we develop a new SMTP library to send voice mails. This SMTP library is asynchronous and can work perfectly with most SMTP servers. And, it is written in C/C++ language. We upgraded MSS V23 and cloud-MSS to replace python-smtplib with this new SMTP library. Hope you can enjoy latest versions. By the way, since MSS V23 has been released for several months and we got very better result, we think it is time to release new LTS version which is V24 and new stable version which is V25 in the end of this year or in the beginning of next year. MSS stable versions are upgraded to V3.1.6 (build 20110813). This version is upgraded to support voice mail nesting follow-me services. When a local extension has been configured with voice mail and following me services, the voice mail service will be triggerred if all follow-me parties don’t answer the incoming call. Some bugs in web management are also fixed at the same time. These modifications have been merged to V4 latest version. Why I cannot receive voice mail? When some customers use miniSipServer cloud ( for local minisipserver, the same) to process their voice mail, but they are often confused why cannot receive voice mail in their email box. For MSS cloud, there is a little difference. First, MSS cloud doesn’t support MWI (message waiting indication), so it can only send voice messages to your email address. Sometimes, customers often forget to configure SMTP server information which is necessary for MSS cloud to send your voice mail, or they often forget to cofigure email address of specific extensions. So let’s describe more details about these. Before this, I assume that you have signin into your MSS cloud account. If not, please sign-up one. Please look at the figure. You need click “system information” linker, then fill your SMTP information there. By the way, for Gmail accounts, they are always required to configure secure connection. 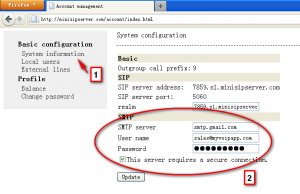 If SMTP information are all right, MSS will use it to send voice mail. Please click “local users” linker and select or add one extension to edit. For voice mail feature, you must configure “eMail address” to make MSS cloud know where the voice mail should be sent to. Of course, you also need configure “voice mail” service right to this local user / extension. So after that, for no-answer incoming calls, MSS will prompt the caller party to leave messages and save/mail them to the user’s email address. V3.1 is update to support new “voice mail” features. Messages waiting indicator (MWI) is supported in this new version. 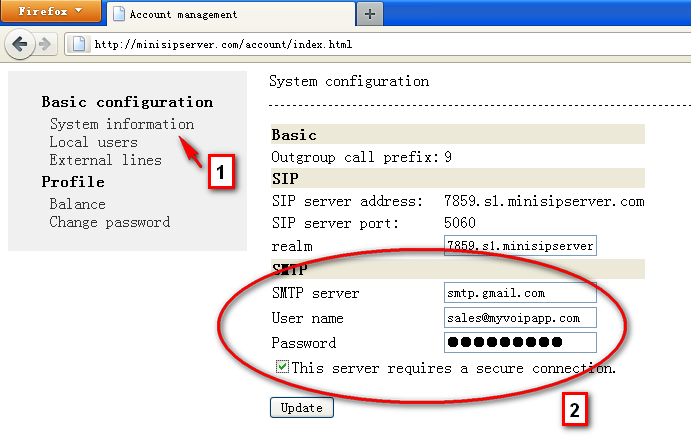 (1) Store voice messages in the server, and indicate the SIP phones how many voice messages are stored in the server. If the SIP phones can support MWI too, they will display the number of voice messages. (2) Users can dial into MSS to check their voice messages. Please refer to online service document which have been updated with a demo configuration of Xlite and MSS.